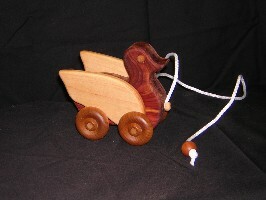 0570 Duckling, small pull  - $26.65 : Red Bird Mission Crafts, Hand crafted art. This small duckling will quack you up! It has about a 19" rope has a ball on the end for a little one to pull it around. The wings move as it's being pulled throughout the house or on the walkway. It's finished with a non-toxic mineral oil rated for food contact. This is a child-safe finish that preserves the natural wood feel of the simply designed and sturdy toy. It measures about 5" long from beak to tail and about 4" tall.